Italian born singer and songwriter Giada Valenti will be performing in Pittsburgh on Sunday, April 7 at the Cabaret at Theatre Square. Since Giada was coming to Pittsburgh, I wanted to know more about this amazing performer. I already know that she has an incredible voice—her rendition of Se from Cinema Paradiso is phenomenal. You can see from her social media pages that she is a world traveler, loves her family and adores her fans. But there has to be more to her other that what you see on the internet; I was convinced of this. Recently, I was able to connect with Giada and learned that, yes, she is more than just a performer. She is a very kind, humble individual who not only has the gift of song but she loves to eat. Giada is an adventurous gastronome who has a weakness for Nutella. My kind of foodie! Giada does have a hectic travel schedule, so she tries to eat healthy while doing so. She loves her carbs, so pasta is must for this Italian native. But how can a bonafide foodie be a world traveler and look this amazing? I asked Giada if there are certain Venetian dishes that she misses most. 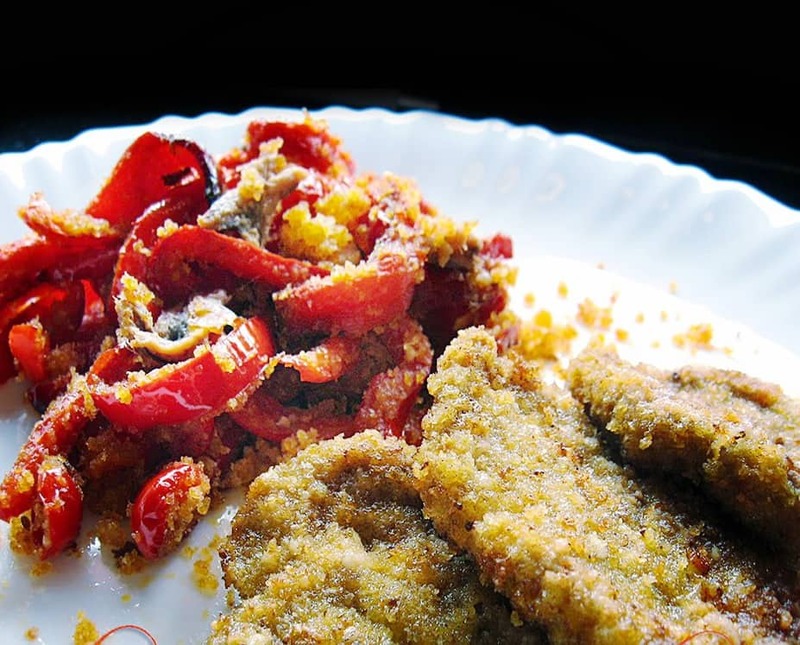 She confessed that “polenta with Fegato alla Veneziana (polenta and liver Venetian style) … and the sweet cookies that we make for Carnival in Venice like Frittelle and Crostoli or Gubbana for Christmas” are the ones that she misses most. However, Giada confesses that when she does go home her mom will make all her favorite dishes. “I have so many she knows I love, and honestly nobody can make them as delicious as she does,” she says. Giada has a sweet tooth and professes her love for Nutella. She has loved this chocolate hazelnut spread since she was a child. In fact, she has it twice a week. Giada is a talented singer and songwriter, has sung around the world to sold-out audiences and has two best selling CD. Yet, this talented artist still likes to cook her own meals when she is home. She says that she does not get to cook much because of her schedule, but it is something that she loves to do when she can. She especially loves to cook the recipes from her Grandmother Maria. I asked her if she could share something about her style of cooking, a piece of kitchen wisdom that she knows that would be helpful to the rest of us. Being the generous person that she is, Giada was quick to share this tidbit of information: fresh herbs. Finally, I asked Giada to share a recipe for the blog and she was more than happy to. She is sharing her recipe for Homemade Gnocchi and White Fish filet with Hazelnuts and Peppers. These dishes are simple, yet are favorable. The gnocchi can be used with a variety of sauces; the possibilities are endless and are limited only by your imagination and tastes. The fish is a simple pan fried dish that will pair nicely with some hearty leafy greens as a salad. Both of the recipes that Giada provided are healthy, light and are perfect for the spring and warm weather cooking that is coming. A big thank you to Giada for sharing these recipes, Grazie Giada! 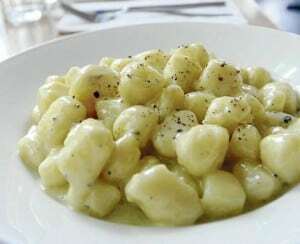 Gnocchi (pronounced NYO-kee) are for sure one of my favorite dishes. They are dumplings made of potatoes and flour. I’ve learned to make them when I was a child with my mom and grandma. They are easy to make, healthy and delicious. You can serve gnocchi with any of your favorite pasta sauces, or even with a simple sauce of melted butter and grated Parmesan cheese. One of my favorite sauces for gnocchi is also the traditional “ragu di carne,” tomatoes sauce with meat! 2 eggs (one every two mid size potatoes).For a lighter version of Gnocchi, and still super delicious, you can skip the eggs!! Sea salt for the cooking water. 1. Steam the potatoes in a large soup pot with a steamer insert, or steam basket, for 30 to 40 minutes or until they can be pierced with a knife. 2. Pass the cooked potatoes through a food mill or potato ricer. We do it this way rather than mashing them by hand because it’s really important to achieve a smooth, uniform texture. And whatever you do, don’t put the potatoes in a food processor, as this will make them too gummy. They can also be smashed with a fork… Like they did in the old days!! 3. Turn out the cooked potato mixture onto a lightly floured surface, and add about half of the flour. Knead until you have a sticky mass and keep adding flour a little at a time until the dough is smooth. You won’t necessarily use the whole amount of flour. Add the eggs too. 4. Cut the dough into smaller sections, and roll each piece into a long cylinder about ½ inch in diameter. Then cut each cylinder into individual pieces about ¾ inch in length. 5. Fill a large pot with water and generously salt the water with a good handful of sea salt. The water should taste like seawater. Bring the water to a boil. 6. Meanwhile, shape the gnocchi by pressing each piece between your thumb and the tines of a fork, using a slight rolling motion. One side of the gnocchi should have the imprint of the fork and the other side a small indentation from your thumb. 7. When the water comes to a boil, drop the gnocchi into the water. In about two minutes, the gnocchi will float to the surface of the water. Let them cook about fifteen seconds more and then skim them out with a slotted spoon. 8. Drain the gnocchi well and serve immediately topped with a basic tomato sauce and grated Parmesan cheese, or with any of your favorite pasta sauces. This recipe makes 4-6 portions of gnocchi. Note: You can boil the potatoes for gnocchi, like if for some reason you don’t have a steamer basket or colander. But if you do, boil them whole, and leave the peels on so that they don’t absorb a lot of water. Too much water will make the gnocchi gummy rather than fluffy. Once the potatoes are cooked, let them cool just long enough so that you can handle them, and then peel and proceed with Step 2 above. This is a very delicious and light recipe my mom shared with me a while ago and I just loved it!!! Easy to make, healthy and light!! Let the fish filet soak in water and a little of bit milk in the fridge for a few hours. If you use frozen fish filet, thaw the white fish in the fridge to soak in a bit of water and a drop of milk the night before. Cut the peppers into thin strips and brown them in a pan with a little olive oil. Add to the pan with the fish , 2-3 slices of bread to brown. Turn the fish over the side before the chopped hazelnuts burn and finish cooking. Add a handful of parsley to the peppers and add some white wine. Cook till the wine is evaporated. Cover the fish with the sautéed peppers and the toasted bread and serve.